A tall shrub or short tree to 5m planted near the sea in sandy soils as a wind-break and sand-stabiliser. It loves a salty soil. A white version of Japanese Rose growing on the right. 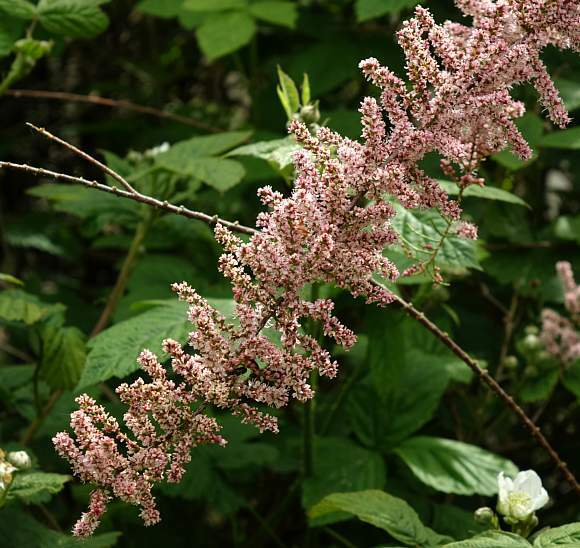 A mass of fine feathery twigs covered with as-yet un-opened pinkish red flower buds. These are new seedlings growing amongst the grass. The larger red tips are developing buds. 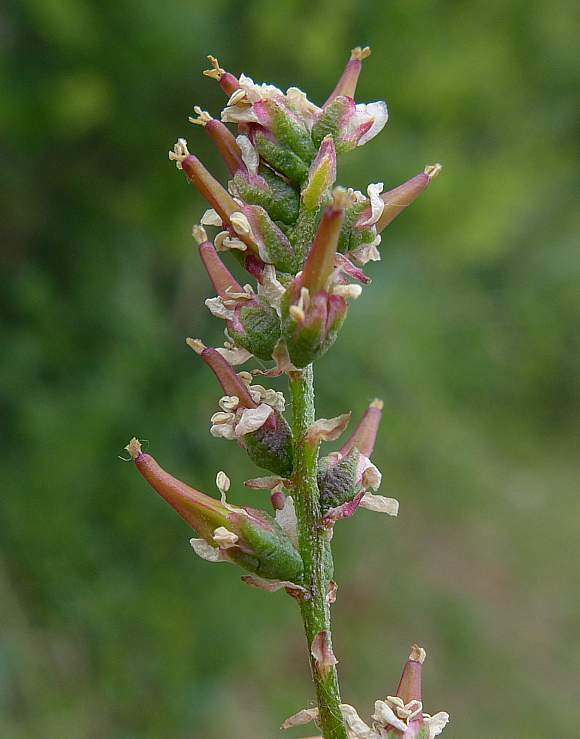 When fully open (not in this photo) the raceme of flowers is about 2 to 5cm long and 4 to 5mm wide. 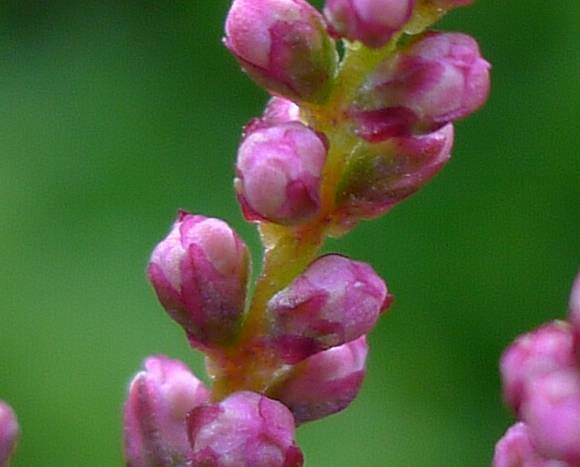 The only time when the four sepals, which are pinkier than the flowers, are visible is when the flowers are un-opened. 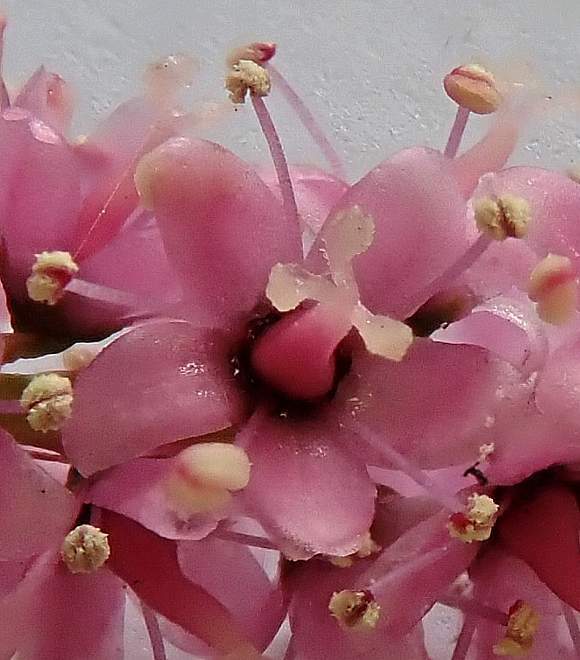 The panicle of flowers is only amout 5mm wide when the flowers are fully opened, and 2-5cm long. The style is pinkish-red and conical with a white 3-bladed (sometimes 4-bladed) style attached like ships (or narrowboats) propeller. 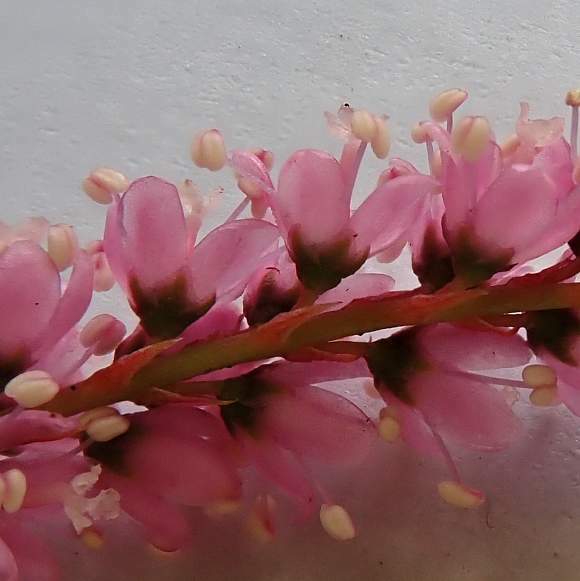 The 5 anthers are white and presented T-bar fashion on long pink filaments projecting outwards beyond (and between) the petals. The filaments all emerge from a nectariferous disc in the centre of the flower, bearing nectar. 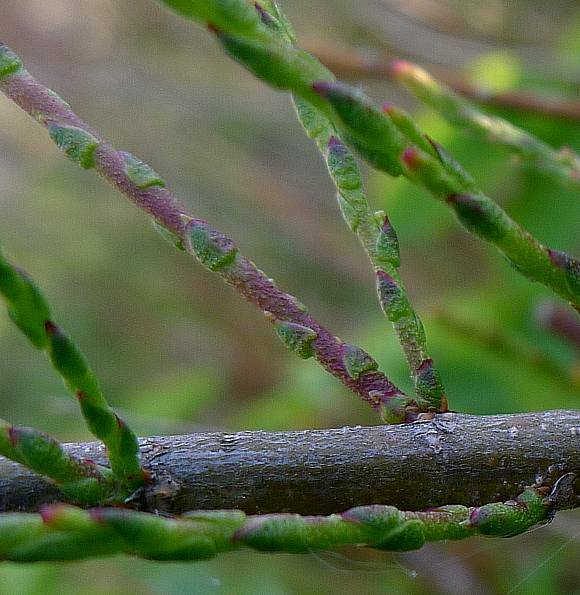 Twigs are reddish. Leaves small and scaly and held flat against the twig. Twigs are reddish. 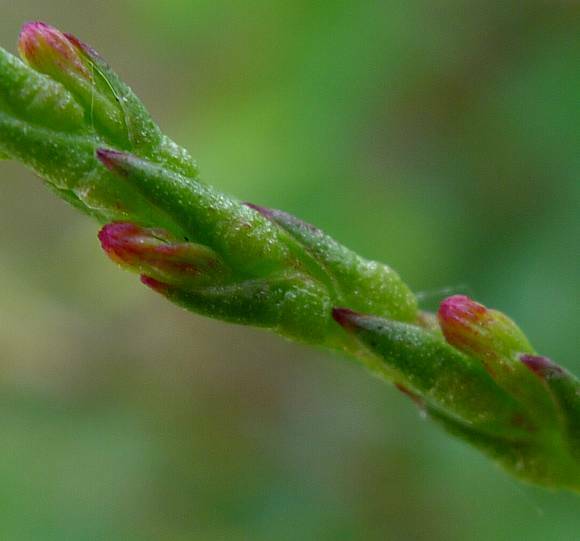 Leaves small (1.5 to 3mm long), scaly and held flat against the twig. Gone to fruit. The petals have dropped off and the ovary has swollen and extended to become the fruit. Gone to fruit. Still cupped by the sepal cup the fruit are gourd shaped, but with a square cross-section (although this could be because this might be a 4-petalled version?). Some anthers still attached as are some of the shrivelled and faded petals, as well as the remains of the 3 to 4 styles atop. 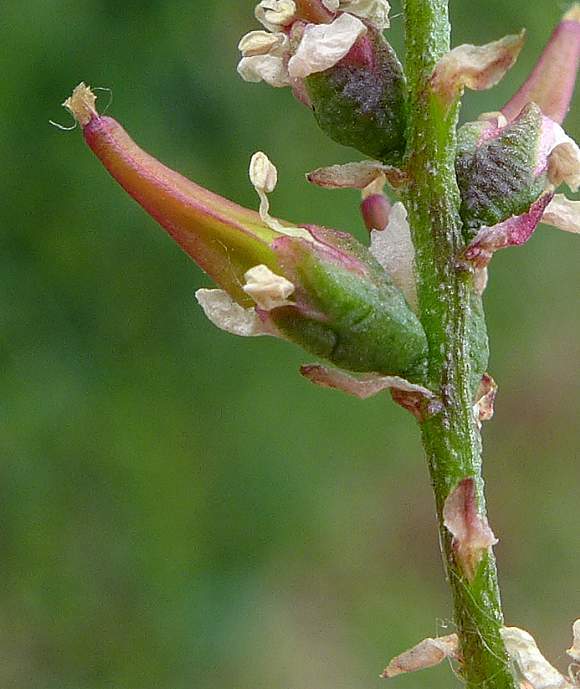 The fruit with stigmas still attached to the tip and anthers still poking out from the sepal cups. The fruit is a capsule containing seeds with a tuft of hairs atop. 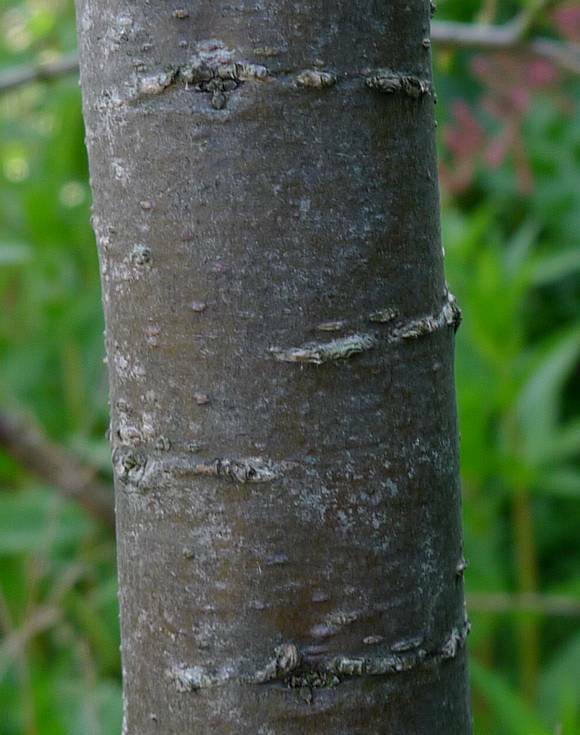 Main bark of young trees is narrow, smooth and reddish-brown. As the tree ages it becomes bluish-purple, ridged and deeply furrowed. Growing in a garden, I can't guarantee this is not a cultivar. It strikes your Author that in this instance the flowering branches look like large versions of the individual flowering racemes. 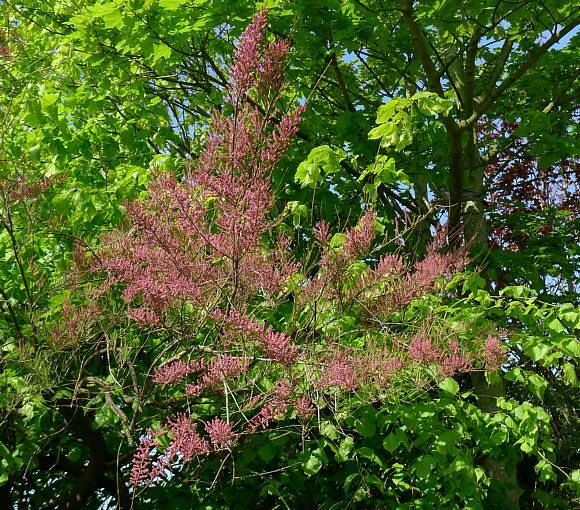 This tree was mainly unusually and strikingly pinkish in flower, another reason to believe it is a cultivar. There are some 4-petalled amongst the 5-petalled flowers on this tree. 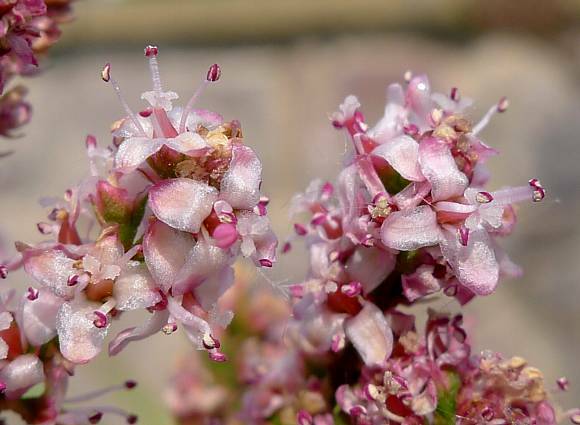 When opened, the twigs, covered in flowers held close to the twig, gain a very fuzzy appearance. 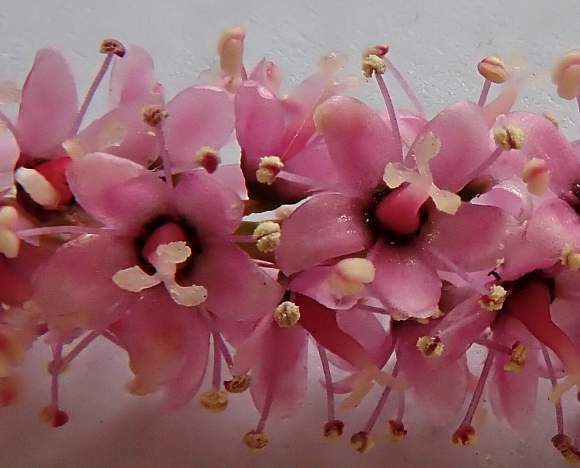 The flowers have 4 pink petals 1.5 to 2mm long..
A style with a 3 pronged stigma in the centre surrounded by 4 filaments with red anthers (best seen in the topmost floret). 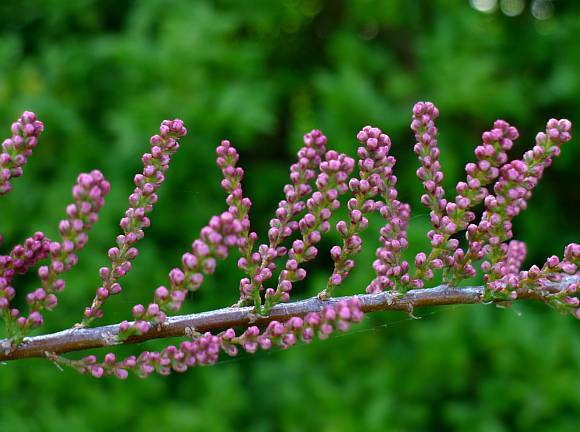 Distinguishing Feature : The fine filigree featheriness of the foliage and the catkin-like panicles of pinkish flowers held very close to the stems. 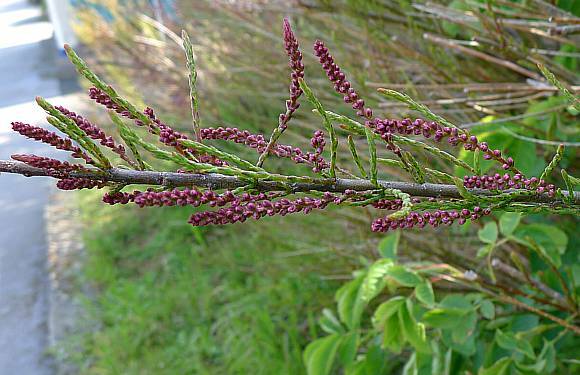 Tamarisk as in Tamarix gallica is deciduous as are three other species, but many other species of Tamarix are evergreen. 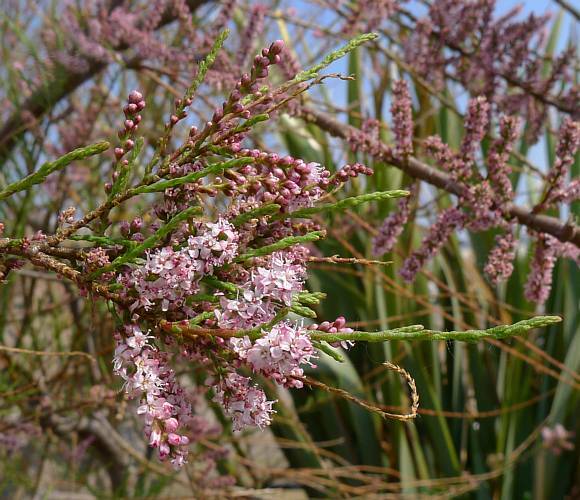 Tamarisk species (of which there are 50 to 60 in the World) are salt-loving tall shrubs or short trees, growing from 1m to 18m high. 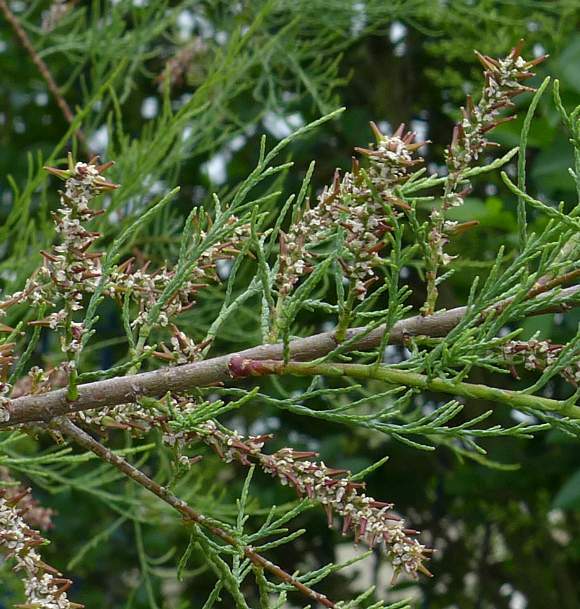 The leaves are tiny, green, over-lapping, and similar to those of Cypresses, hence the other common name 'Salt Cedar' although it belongs to neither the Pine Family (Pinaceae) nor to the Cypress Family (Cupressaceae). But un-like the leaves on Cypresses, the leaves (which look like tiny scales) on Tamarisks are alternate. 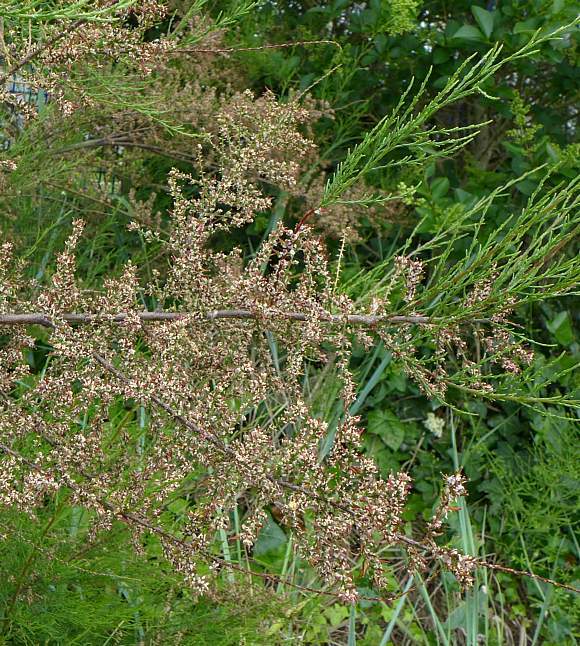 Tamarisk does not bear cones but rather a capsule that is full of tiny seeds with a tiny pappus and are borne by the wind. Indigenous to Saudi Arabia, the trees usually grow in saline (salty) soils, tolerating up to 15,000ppm of soluble salt, but will also tolerate basic soils. 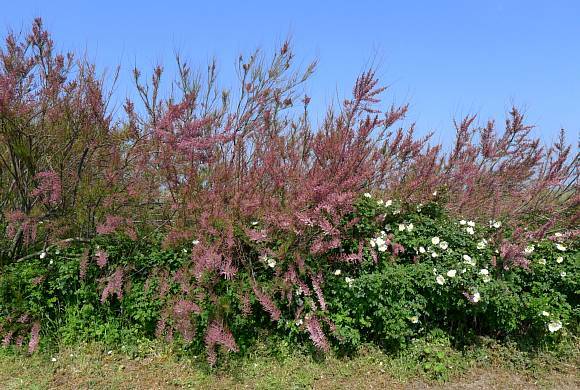 In the UK they are mainly planted near the sea in seaside towns as ornamental shrubs. It is also planted on sandy shores to act as a sand-stabiliser and as a windbreak. It seems to also have an established presence in the Greater London area, but perhaps that simply reflects the greater number of observers in that area. It doesn't grow north of Northumberland in the UK. It can self-seed, but that does not occur often. 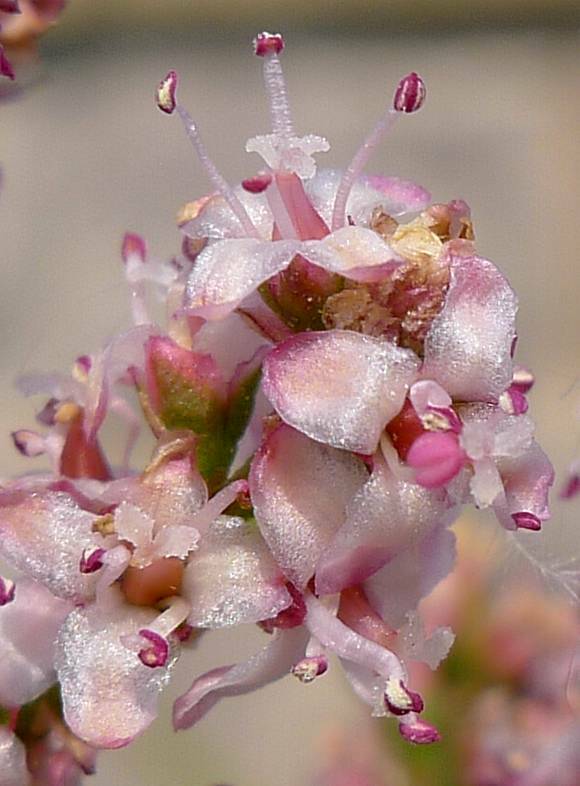 The flowers are pinkish-white, small, up to 4mm across and have four petals, persisting when in fruit. The fruits are pinkish and shaped like a gourd. 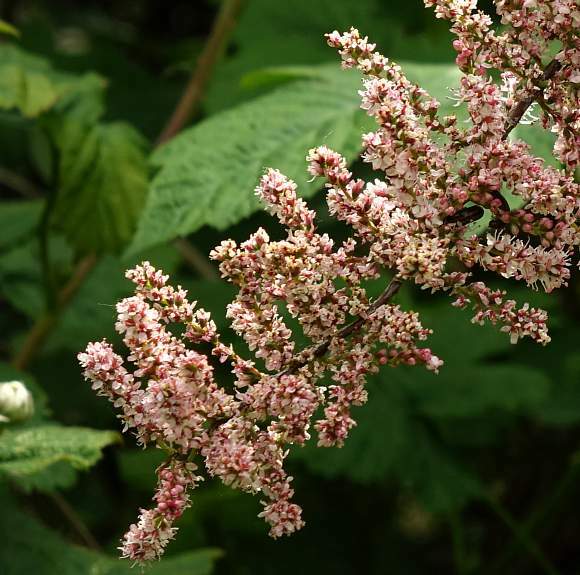 It flowers first in May, but there may be a second flowering in August in some years. 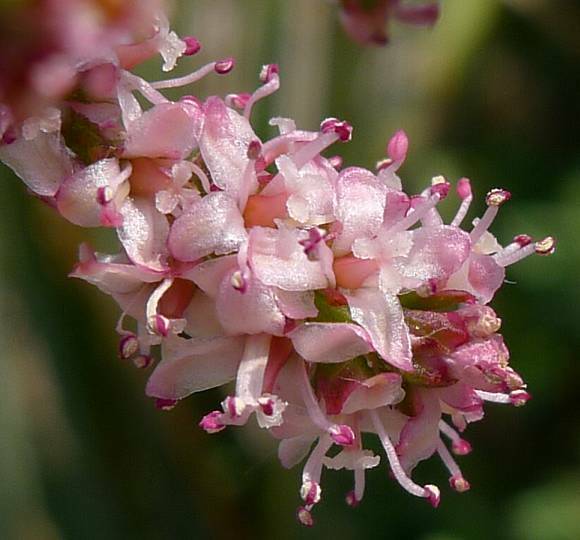 In the Middle East it has been used medicinally to treat rheumatism and diarrhoea. It can also treat liver damage due to such compounds as alcohol and other liver toxins. 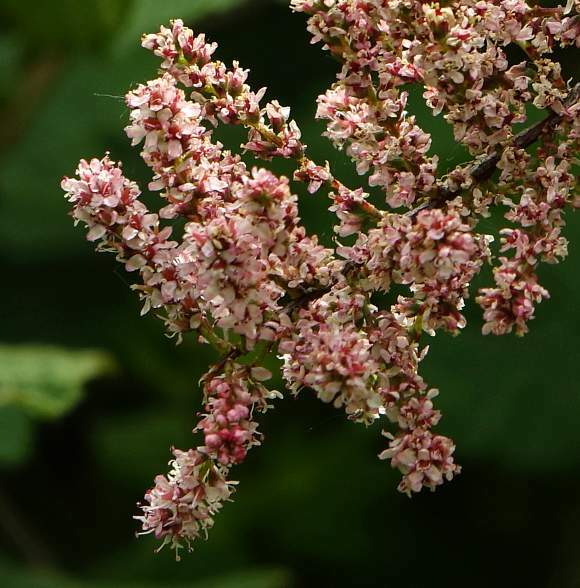 Your Author admits he is puzzled by the number of petals reported by books and websites for Tamarisk. These sources say it has five petals, but the above photographs clearly show but four. In particular, he can find no photographs from other sources showing five petals! Can all written sources be wrong? Even Clive Stace writes that it has five petals. 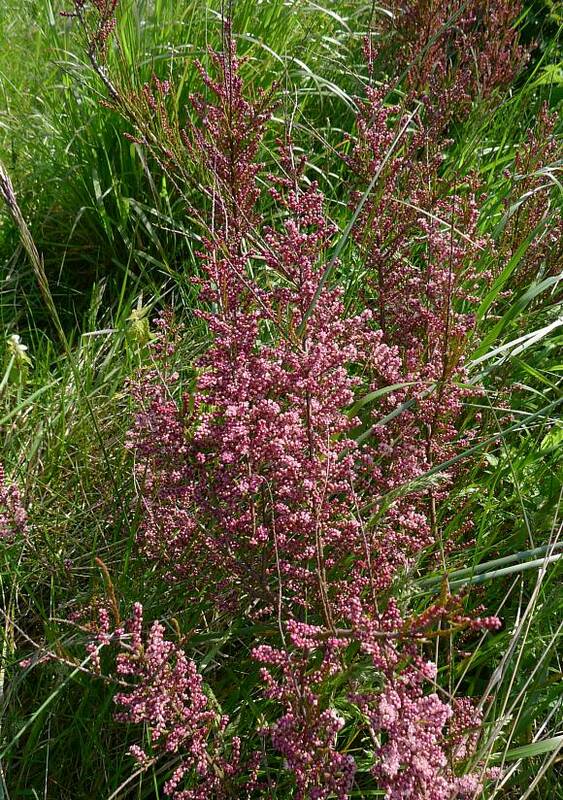 Or are the above photographs not of Tamarix? 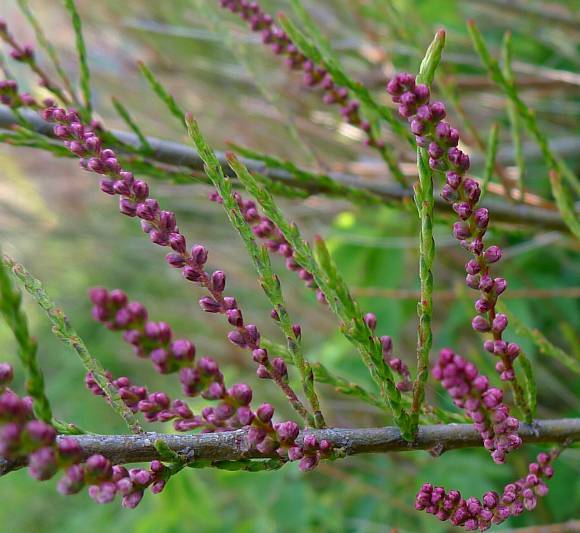 The Author finds that very hard to believe since all other photos on the web seem to show Tamarix with four petals. If anyone can shed light on this, please write in. 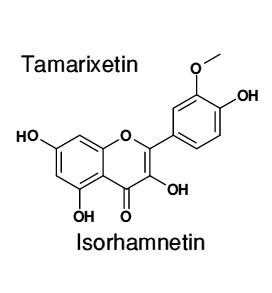 Both IsoRhamnetin (in trace amounts only) and one of its glycosides IsoRhamnetin-3-Glycoside are present in Tamarix, and are sometimes known as Tamarixetin and Tamarixin respectively on account of their being found in Tamarix. 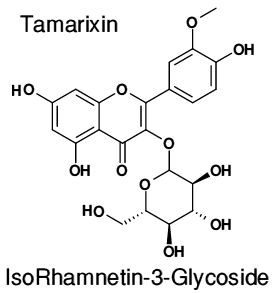 Tamarixetin is the 4'-methyl ether of Quercetin. 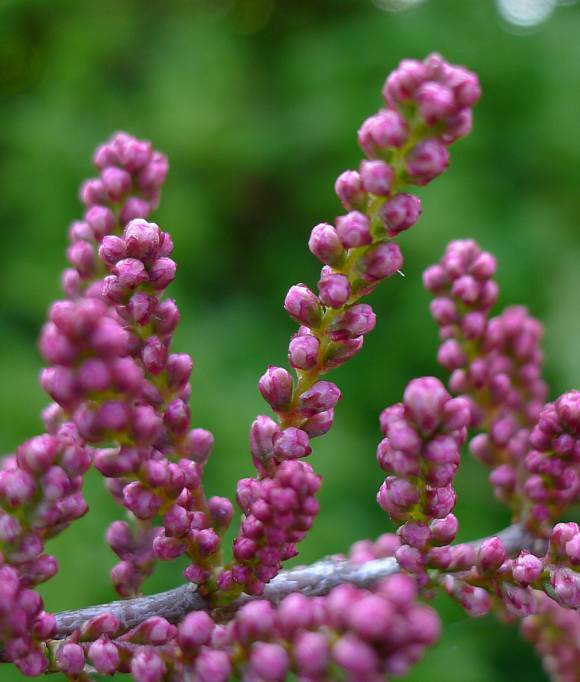 Tamarix also contains Vitexin, which is also found in Passion Flower and is the glycoside of the flavone Apigenin.